Tiger Airways enters 2013 more upbeat after ending a string of seven consecutive quarters of losses and returning to profitability in the last three months of 2012. But the Singapore-based low-cost carrier group still faces a challenging 2013 as it tries to reverse the losses at its subsidiaries or affiliates in Australia, Indonesia and the Philippines. Tiger’s original Singapore operation has recorded an encouraging improvement to its bottom line after going through a rough patch in late 2011 and early 2012, when over-capacity led to a decline in yields and load factors. The outlook for Tiger Singapore remains relatively bright, particularly as the carrier starts to see benefits from its new connection product. But LCC competition in Singapore is intense, making it challenging for Tiger and rival Jetstar Asia to post high profit margins. Market conditions in Tiger’s other three home markets are even more challenging, with profits in the short-term unlikely although the group remains optimistic about its long-term prospects in Australia, Indonesia and the Philippines. Tiger Airways Holdings reported a net profit of SGD2 million (USD2.5 million) in the three months ending 31-Dec-2012, which is the group’s fiscal third quarter (3QFY2013). While modest, the profit was the first time Tiger was in the black at the group level since 3QFY2011, when the group turned a net profit of SGD30 million (USD37 million). The group’s loss in 3QFY2012 was SGD17 million (USD21 million). Tiger Singapore turned a SGD27 million (USD33 million) operating profit for 3QFY2013, marking its third consecutive quarter of profits. The Singapore operation, which has generally been profitable since Tiger had its initial public offering in early 2010, incurred an operating loss of SGD5 million (USD6 million) in 3QFY2012. Tiger Singapore was also in the red in 2QFY2012 and 4QFY2012 before returning to the black in 1QFY2013. The nine months in the red, from Jul-2011 to Mar-2012, came as Tiger flooded the Singapore market with capacity increases that for a few months exceeded 50%. The huge capacity increase, which came during a period in which rival LCC groups Jetstar and AirAsia also rapidly expanded their operations in Singapore, could not be absorbed, leading to a drop in Tiger Singapore’s load factors and yields. Singapore-based Jetstar Asia was similarly impacted, recording an 81% drop in profits for the 12 months ending Jun-2012 to only SGD4 million (USD5 million). The Singapore market has now fully recovered with the capacity that was added in calendar 2H2011 and 1Q2012 finally being absorbed. The recovery is reflected in the year-over-year improvement in Tiger Singapore’s 3QFY2013 figures, including a 7.9ppt improvement in the carrier’s load factor to 85.6%. Capacity, as measured by ASKs, in the quarter was up by 16% while RPKs were up 28% and revenues increased 35% to SGD173 million (USD213 million). Tiger Airways CEO Koay Peng Yen acknowledged that the capacity increases pursued in Singapore in FY2012 “was too sudden” and explained they were triggered by special circumstances following the grounding of Tiger Australia. While Tiger is now focusing more on growing its new affiliates in Indonesia and the Philippines, it still sees more room for profitable growth in Singapore even with the country’s LCC penetration rate having recently exceeded 30%, compared to essentially zero a decade ago. One driver of further growth at Tiger Singapore will be transit traffic following Tiger’s recent launch of a connection product which allows its passengers to transit in Singapore without having to clear immigration and re-check their bags. Mr Koay said it is too early to provide figures on passengers using the new tigerconnect product and connecting to flights operated by new long-haul low-cost carrier Scoot. But he said “we’ve seen very good movement in bookings” and Tiger will look to add capacity on routes which attract a large number of transit passengers. Transit passengers now account for roughly 15% of Singapore traffic at Jetstar but until now Tiger has never targeted this sector of the market. With a connection product, Tiger Singapore should be able to tap a new area of growth, boosting its traffic and yields even if growth in the local point-to-point short-haul LCC market ends up slowing as many expect. The transit product also boosts the prospects of Tiger’s new affiliates in Indonesia and the Philippines as both these carriers are expanding their operations to Singapore and will gain from being able to connect with Tiger Singapore. The improvement in Tiger Singapore’s bottom line over the last year was also partly driven by efficiency improvements, particularly an increase in aircraft utilisation. In FY2012 the post-grounding regulator-enforced capacity limits in Australia and the delays in launching new affiliates in Asia forced Tiger to put more aircraft into the Singapore market, leading to higher capacity in Singapore as well as lower utilisation. Utilisation has now returned to more normal LCC levels as since the beginning of FY2013 Tiger has launched its new affiliates in Indonesia and the Philippines while Tiger Australia has returned to pre-grounding capacity levels. This in turn has allowed Tiger to shift A320s out of Singapore and bring utilisation levels in Singapore back to normal. The expansion in Australia, Indonesia and the Philippines also has allowed Tiger Singapore to allocate most of its FY2013 deliveries to these three markets, leaving it with a smaller and more efficient fleet in Singapore. Tiger reported average aircraft utilisation of its fleet in Australia and Singapore of 11.8 hours in 3QFY2013, a 37% improvement over 3QFY2012. Tiger Australia is now back to an 11-aircraft fleet while Tiger Singapore ended 3QFY2013 with 19 A320s. Tiger Singapore will add one more A320 in 4QFY2013, giving it a fleet of 20 aircraft. This is still below the level Tiger Singapore was at during FY2012 when it found itself with too many aircraft as a result of the problems in Australia and the delays in establishing the new joint ventures in Indonesia and the Philippines. Tiger’s new Indonesian affiliate Mandala, which launched services in Apr-2012, will take its seventh A320 in Feb-2013. Tiger’s Philippine affiliate SEAir now operates five aircraft, including three A320s which were added during FY2013 and two A319s which the carrier began leasing from Tiger in Dec-2010. SEAir originally operated these two aircraft as part of a partnership programme with Tiger and became an affiliate in Jun-2012 after Tiger acquired a 30% stake in the Philippine carrier. SEAir and Mandala have both struggled during their start-up phases. Tiger recorded a SGD8 million (USD10 million) loss in 3QFY2013 related to its stake in SEAir, which indicates the Philippine carrier incurred a SGD28 million (USD34 million) loss in the quarter ending 31-Dec-2012. SEAir faces intense competition as it is the fifth LCC in the crowded Philippine market, which includes market leader Cebu Pacific, Philippine Airlines' (PAL) budget subsidiary AirPhil Express, Zest Airways and AirAsia Philippines. The Philippine market was plagued by over-capacity and irrational competition for much of 2012 and the short-term prospects remain relatively bleak unless there is consolidation. SEAir originally was a full-service regional carrier but has adopted Tiger’s LCC model and will adopt the Tiger brand in 2013, contingent on regulatory approval. In 2QFY2013 SEAir launched seven domestic trunk routes from Manila International that are also served by Cebu Pacific, PAL and Zest. SEAir currently only has a 5% share of capacity in the Philippine domestic market, leaving the carrier in a potentially vulnerable position. SEAir also has an operation at Manila alternative airport Clark, where it now operates one domestic and four international routes. SEAir competes on all but one of these routes with AirAsia Philippines, which is based at Clark and launched services in Apr-2012. 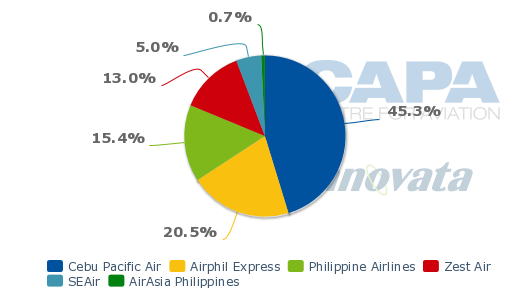 AirAsia Philippines currently accounts for a 25% share of seat capacity at Clark while SEAir accounts for a 23% share. Like the SEAir/Tiger joint venture, AirAsia Philippines has struggled in its start-up phase, an indication of the challenges smaller and newer LCCs face in gaining a foothold in the overcrowded Philippine market. Tiger recorded a SGD5 million (USD6 million) loss in 3QFY2013 related to its stake in Mandala, which indicates the Indonesian carrier incurred a SGD15 million (USD18 million) loss in the quarter ending 31-Dec-2012. Tiger currently owns a 33% stake in Mandala, which was a full-service carrier operating in Indonesia’s domestic market before it suspended operations and filed for bankruptcy in Jan-2011. After 15 months of tedious negotiations between Tiger and new Indonesian investors, Mandala re-launched in Apr-2012 following Tiger’s low-cost model and currently operates seven international and four domestic routes. As the losses that have been incurred during 2012 would be expected with a start-up operation, the true test for the new Mandala will come in 1H2013 as the carrier expands its fleet and network. The biggest challenges will likely come in the domestic market given the intense and often irrational competition on Indonesia’s trunk routes. Entering a market as the seventh or eighth carrier is never an easy task. Mandala does have the advantage of having market awareness from its pre-Tiger era but back then it was a full-service carrier with a much different product proposition. The international market should be easier to penetrate and Mandala’s reliance on the Singapore market should particularly help mitigate risks. 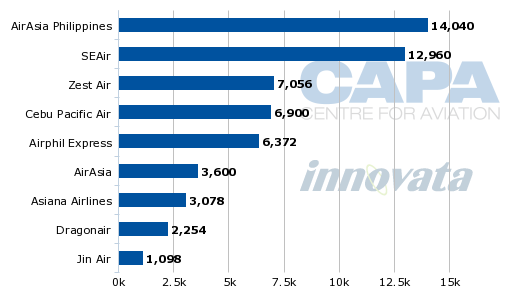 Given its ties to Tiger it is not surprising Singapore has so far been the carrier’s second largest destination after Jakarta. The Indonesia-Singapore market is large and growing fast but with bilateral limitations restricting further expansion, particularly on the Singapore side. With Mandala, the Tiger Airways Group can access Indonesian traffic rights and launch services it otherwise would be unable to operate with Singapore-registered aircraft. Mr Koay acknowledges the challenges Tiger faces in the Philippines and Indonesia, explaining “we still have start-up issues we are resolving.” But he adds Tiger remains confident in the long-term potential and the group is committed to increase its share of these important Asian markets. Mr Koay said while Tiger is always looking at potential new joint venture opportunities in Asia, the group is now focusing on improving the profitability of its two newest affiliates. Tiger is believed to be looking at establishing new affiliates in several potential Asian markets including South Korea, China and Myanmar. The group issued a statement in early Jan-2013 announcing that SGD9 million (USD11 million) of proceeds from its 2010 IPO have been utilised “for the investment in a new joint venture airline” but Tiger management explained during the 3QFY2013 results call that this refers to its investment in Mandala or SEAir rather than a potential third Asian affiliate. Mandala and SEAir will both continue to expand in FY2014 as most of the 10 additional A320s the Tiger group will take in its next fiscal year will be allocated to Indonesia and the Philippines. Tiger is also committed to expanding Tiger Australia if its proposed joint venture with Virgin Australia is approved. In late Oct-2012 Tiger announced the sale of a 60% stake in its fully owned subsidiary Tiger Australia to Virgin Australia. The proposed deal is now being reviewed by Australian competition authorities and will be voted on by Tiger’s shareholders at a meeting on 31-Jan-2013. As part of the joint venture agreement, Tiger and Virgin Australia are committed to growing Tiger Australia from 11 to at least 23 A320s. Mr Koay said at least eight and potentially all 12 of these aircraft will come from Tiger’s order book. Tiger has orders for 27 additional A320s for delivery by the end of 2015, including the 10 aircraft slated to be delivered in FY2014. Tiger has not yet decided on an allocation for any of these orders but Indonesia, the Philippines and to a lesser extent Singapore should be able to absorb the 15 to 19 aircraft which do not end up in Australia. In fact if Tiger ends up succeeding at turning around Mandala, SEAir and Tiger Australia, the group could end up with a shortage of aircraft – the opposite of the situation it faced only one year ago. But the long-term future of any of these three carriers is hardly assured given the challenges they face in their home markets. Australia also has become a challenging and intensely competitive market. Rapid expansion at Tiger Australia would lead to even more capacity flooding Australia’s domestic market, potentially leading to further reduction in yields. Tiger was hoping for an improvement in profitability at Tiger Australia during 3QFY2013 as the carrier finally returned to pre-grounding capacity levels. But instead the carrier saw a further drop in profitability. Tiger Australia recorded a SGD13 million (USD16 million) operating loss in 3QFY2013, compared to a SGD9 million (USD11 million) loss in 3QFY2012. Passenger traffic increased 123% to 714,000 but revenues only increased 80% to SGD73 million (USD90 million). Tiger Airways Group CFO Chin Sak Hin said “competition has kept load factors and yields depressed” in Australia as multiple carriers added capacity. With Tiger Airways Australia planning to further accelerate expansion following the proposed change of ownership, the prospects of rationale capacity in the Australian market appear dim. Tiger Australia, which has struggled financially since launching in 2007, will likely continue to incur losses. As a group Tiger also expects lower profits in 4QFY2013 compared to 3QFY2013, pointing out that the quarter ending December is typically its strongest. For the full fiscal year Tiger also expects to report another loss given the SGD30 million (USD37 million) in losses already incurred through the first three quarters. While Tiger’s group outlook has improved significantly as new Asian affiliates have finally launched and Tiger Australia has returned to pre-grounding capacity, it remains relatively gloomy. Profits in Australia, Indonesia and the Philippines are unlikely in the near to medium term while the Singapore LCC market continues to be competitive and relatively mature, resulting in thin profit margins. Tiger continues to look for new Asian markets to enter but there are fewer golden opportunities now that LCCs have been successfully established in most of Asia’s major markets. Tiger’s larger peers are expanding just as fast and in some cases even faster. Tiger faces more challenges in 2013 but if it makes the right moves could eventually find itself in a strong position in three of Southeast Asia’s most important markets and with a bigger and stronger portfolio of low-cost carriers.